On average, over thirty children have died after being left in a hot vehicle every year since 1998 and these deaths were entirely preventable. What is most alarming is that the majority of parents who left their children in the car did so unintentionally. Over half of the children who died were in the vehicle because the person looking after them forgot to take them out of the car before leaving them in the vehicle. Preventing these tragedies from occurring is everyone’s responsibility— from parents and caregivers to those who happen to notice a child in a vehicle alone on a hot day. There have been 717 deaths from 1998 to present day due to children being trapped in hot vehicles. An overwhelming number of these fatalities have involved children under six years old. Infants represent the largest share, with 225 of the deaths under a year old and another 382 between the age of one and three. The reason for these accidents can include the assumption that cloud cover or more moderate temperatures make for less dangerous conditions and the forgetfulness of the caregiver. Contrary to what some believe, vehicles can heat up rapidly even on cloudy or temperate days. Some children have died from heat stroke inside vehicles while the temperature was as low as 57 degrees. The reason for this is that a closed vehicle can trap UV rays and the heat from the sun, heating up rapidly in a matter of minutes. Studies have shown that it can take only ten minutes for the inside of an SUV to reach a temperature of 100 on a 73 degree day. If the temperature is 90 degrees, the interior can warm to over 160 degrees in less than ten minutes. Children of all ages are at risk if they remain inside of a warm vehicle, so it is important that you don’t leave your child unattended for any period of time, even if you intend to make a quick trip in and out of a store. 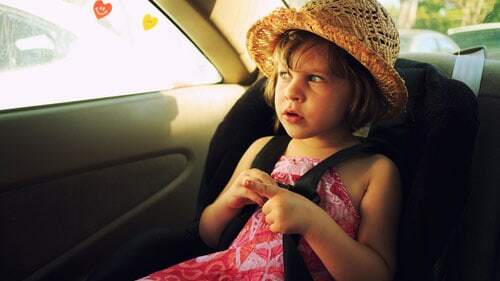 54% of heatstroke related deaths occurred when parents forgot their child, but another 28% were the result of a child entering the vehicle without supervision. The following are ways that you can prevent these accidents or to respond when a child is in danger. Make it a habit to lock your vehicle so that children are unable to get inside while unsupervised. Also make it a habit to look inside your vehicle before you lock it so that you do not forget your child. Never leave a child alone in a car for any reason. There are too many things that can go wrong, regardless of how soon you will return. If you see a child inside of a vehicle on a hot day, give the driver no more than two or three minutes to return before taking action. If the child is unresponsive, remove him or her from the vehicle. Call 9-11 immediately and use cool water to bring his or her temperature down. If the child is responsive, remain at the vehicle until a guardian arrives. Find someone to search for the driver. Taking a proactive approach to vehicular heatstroke may save a life, so do not hesitate to do what is necessary to remove a child from danger. Finally, make sure that any babysitter or caregiver you trust to care for your child understands that he or she may never leave your child unattended in a vehicle. Many vehicular heatstroke deaths involved caregivers who were not the parent or guardian.